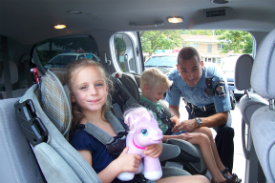 The Downers Grove Police Department will conduct a free, Child Safety Seat event on Saturday, August 27, 2011 from 10:00 a.m to 2:00 p.m. at the District #58 Administrative Office at 1860 63rd St.
Certified child safety seat technicians will provide assistance to partents with installing their child's safety seat. No appointment is necessary. Questions about the event should be directed to Officer Chris Fisher at (630) 434-5601.